The Heartland is the breadbasket of our nation, and our agricultural businesses are at its very heart. 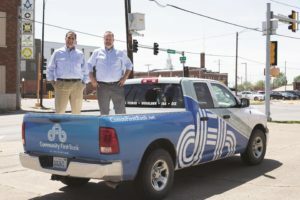 At Community First Bank we understand the needs of our area’s agribusinesses, and we are ready to help them meet the challenges of their complex operations. From tractors to state-of-the-art technology, we will help you get the tools you need to keep up with demand. We combine competitive rates, quick decision-making, and a local agricultural understanding you won’t find at large corporate banks. Farming is one of the most challenging industries, and has been a way of life in Jefferson County for generations. Community First Bank is committed to helping our farmers, large and small, continue this tradition, by providing the funding they need to operate their farms even during tough times. Whatever the size of your agricultural business, from small family farms to large livestock operations, our experienced loan officers can customize a loan for your farming operation. A loan from Community First Bank can help you purchase land, expand or acquire facilities, buy existing working farms, and much more. We offer custom-tailored real estate loans, customization with flexible terms to fit your specific goals — all at competitively low interest rates! Let your hometown bank be your trusted partner in the success of your agricultural enterprise. Our competitive financing options offer tools to fit your operations needs. Whether it is for real estate, equipment, operations or improvements we stand ready to assist you. Call one of our bankers today and explore the flexibility we offer to assist in your farm future success.